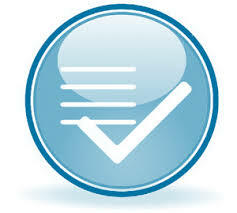 Recent news about Scout RFP raising a Series C round has me considering the e-sourcing software market. Shareholders of sourcing software providers, because it just did not seem the companies that had invested in e-sourcing software had done very well. Sure, Ariba had acquired Freemarkets in 2004 for $493 million in cash and stock. But Ariba also acquired Trading Dynamics and SupplierMarket for $400 and $580 million respectively, in (cheap at that time) stock. Many years later Ariba also acquired Procuri for $100 million. That was a lot of dilution and cash for what ended up not being the primary value driver for the company. 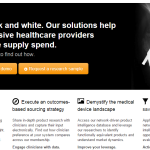 Marlin Equity acquired Emptoris for an undisclosed, but likely not impressive, amount. To be fair, Marlin resold Emptoris to IBM for a rumored $600 million. But then again, IBM discontinued the Emptoris product line, which proves my point. Selectica (now Determine) purchased Iasta for $7 million plus 1 million shares of Selectica stock. DTRM stock is now $0.25 per share. 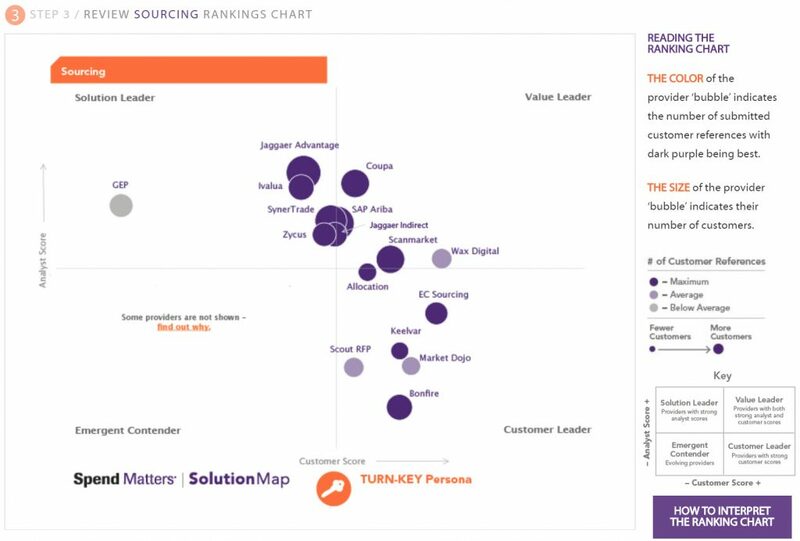 Most of the other pure-play vendors sold themselves and/or became suite vendors: BravoSolution, Ivalua, CombineNet, TradeExtensions, ScanMarket, the list goes on. 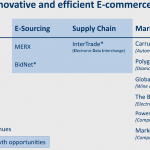 Is E-Sourcing Software A Commodity? Jack Welch in his 2001 book, Straight From The Gut, pointed out that GE’s power systems division purchased “auction software from an outside firm for $100,000 and a pay-by-drink fee. Jack Fish, the sourcing leader of our transportation business, liked the idea but didn’t want to spend $100,000-plus for it.” So what did GE do? The news this week that Scout RFP raised $33 million in Series C financing suggests a bunch of smart investors (e.g., Scale, Workday, Salesforce) disagree with me. After all, this brings the total Scout RFP has raised to $60.3 million! Scout RFP started in 2014. 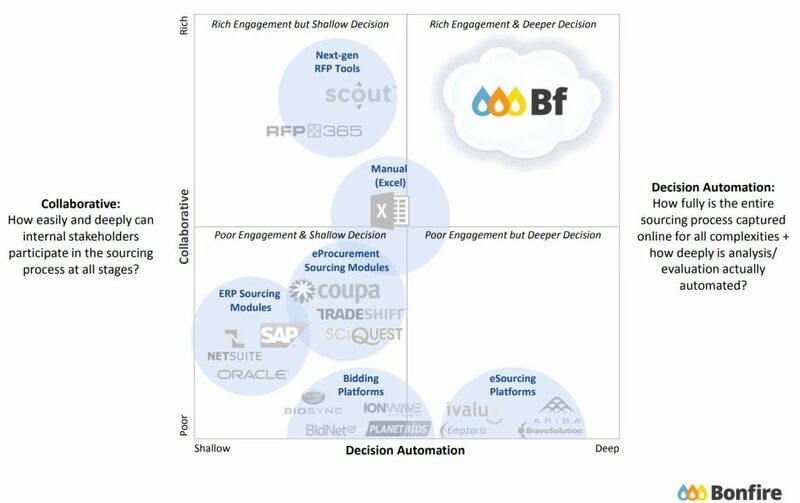 We also know from the above graphic that Bonfire thinks Scout RFP scores well on the collaboration dimension and not so well on the decision automation dimension! I would love to know what Scout RFP’s enterprise valuation and ARR are. We know the valuation is impressive, the ARR better be as well! Next up more on Bonfire and GTY. 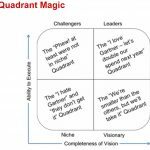 Gartner's Magic Quadrant for Strategic Sourcing Application Suites is now available. This market has now been around for almost 20 years! Bob – Good for Scout. Interesting that Salesforce is involved. Also, regarding the GE story, I think I can top it. In the mid-90’s GE Information Systems built a home-made reverse auction platform for GE to use across its businesses. Things were moving along until one day Jack Welch got a call from a large supplier who had just gotten beat up pretty good in an auction. This supplier was also a big customer of GE’s. This supplier / customer told Welch he was going to use auction software as well for his upcoming contract renewal negotiations with GE. Shortly thereafter word came down to end all auctions. The program manager for the auction project was Glen Meakem, founder of Freemarkets. Glen left GE shortly thereafter, and you know the rest. Great story! I knew Glen was at GE, but did not know that story.